← The Tower – What Are You Willing to Let Burn in Order to Get Free? Instructions: This week is about putting your money where your mouth is. I want you to keep a daily journal. In it, talk about what you’ve done that day to accomplish your goal(s). Tarot Card: Eight of Disks. This one was a bit of a no-brainer. 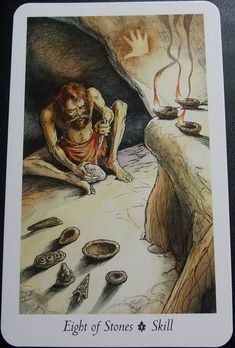 The Eight of Earth is all about the daily grind, about getting it done, day in and day out, about the dilligence it takes to stick to a task until you get good at it (practice, practice, practice), which is what this week’s prompt is about. 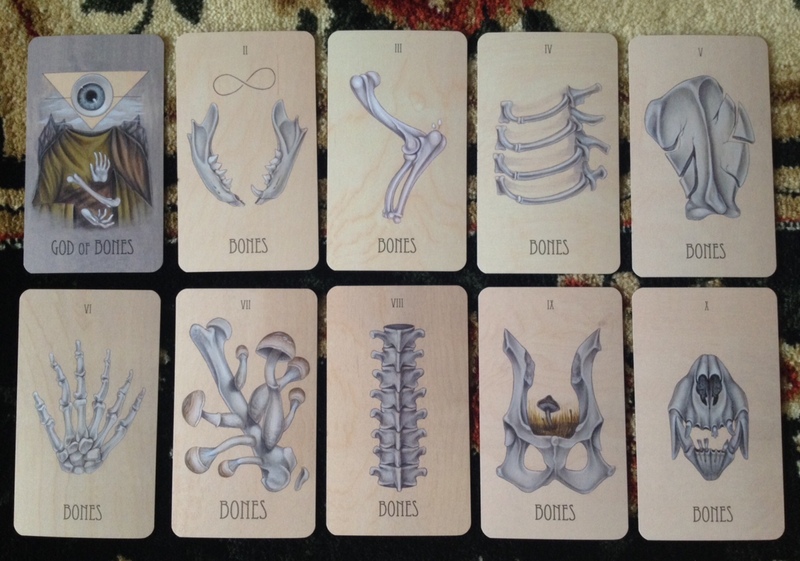 In the Wooden Tarot, the Eight of Bones is a spine, calling up both “put your back into it” and “don’t chicken out (don’t be spine-less)”, which touch on this week’s prompt while also acknowledging the “continuing in spite of your fears and doubts” elelments of Week Eleven. But here’s a thing. In the collective tarot, whose suit of earth is also called Bones, the Eight of Bones is a ribcage, with a crysalys at its heart. A ribcage with eight ribs. There is a crysalys nested in the sternum over (or in place of) the heart. Above the crysalys hangs the figure-8 of the infinity symbol, echoing the transformative potential of The Magician in the Major Arcana. Below the ribcage, fiddlehead ferns are starting to unfurl. That’s what the daily grind, the dedication, will get you. Personal evolution. Personal transformation. Every time I (grudgingly) do plank to build my core-strength and literaly take the pressure off my spine; every time I pause to check in with my body, to see what feels good, to see what feels at all; every time I answer my journaling questions for Life Coaching; every time I push myself to stay with hope (which is so, so scary)… every time I do any of that, I’m letting the crysalys around my heart get a little more mature, I’m letting my internal changes move a little farther on the journey from where I was to where I want to be. Have you made you an option instead of a priority? But the whole point of my Queen of Cups Project is to be more capable of receoptivity, of accepting kindness, pleasure, care, Good Things, into my life and my body without getting all freaked out about it. To be able to receive, as well as give, with an open heart (and open legs). To be able to trust instead of self-sabotaging thanks to my insecurities. To be able to trust realistically and with good boundaries rather than flinging myself off a cliff, so to speak, and hoping my reckless trust will prove I’m worthy of not shattering on the rocks. … And doing that means I have to be able – be willing and able – to be good to myself, to be trust-worthy to myself, to follow-through with, and take care of, my Self. So. If you’ll excuse me, I have Exercises I need to work through, and salsa I need to finish canning. Fun Fact: There is a farely good chance that I have “generalized anxiety disorder”, and have had it since childhood! I’m not looking to get a diagnosis, since meds are probably not the way to go here, but having that “Oh… that explains a lot…” moment after self-diagnostic test #3 came up with the same result, plus having a better idea of which strategies and techniques for managing this stuff are most likely to work? It’s been a big help. This entry was posted in All About Me and tagged New Year New You, progress reports, Queen of Cups Project, tarot. Bookmark the permalink.